Pumping, emptying, mixing, filling and metering ‒ when liquids need to be transferred and set into motion, they require many constituents. Effectiveness – this is what the FLUX brand name stands for. It is recognized across the globe as a byword for quality, for safety and for solutions which are able to fulfil every single demand on a long-term basis. 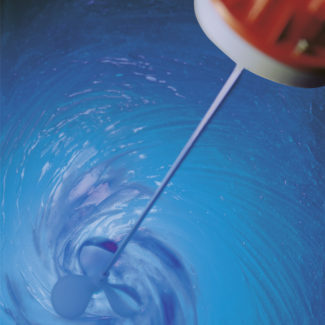 FLUX not only guarantees this for liquids which are relatively easy to pump but also when the pumping medium is viscous or doesn’t flow at all, when it is aggressive or used in processes which are common in the hygiene sector or sectors where there is an explosion hazard. To ensure that the tasks are solved in the best possible way for the customer FLUX has a huge range of expertise to offer. In other words, a lot more than just pumps. From a technical point of view this means a comprehensive product system of pumps, motors, flow meters, accessories and a whole lot more. From the project point of view, “More than just pumps”, means accompanying our customers from the first telephone call through to the end solution ‒ and if required beyond that. This is how FLUX keeps processes moving. FLUX is prepared for any request and in particular for the fact that our customers need more than just pumps. 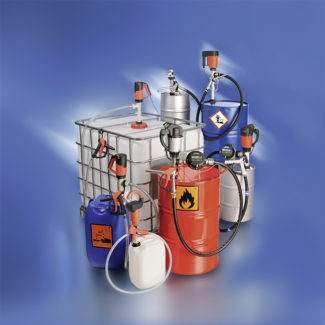 FLUX drum and container pumps are suitable for pumping various low-viscosity and also especially aggressive and highly-flammable fluids. 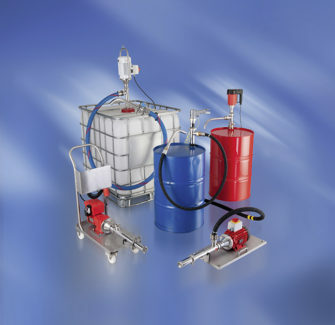 FLUX drum and container pumps are available in versions with explosion protection, with 3A certification as well as FLUX FOOD pumps (Directive (EC) 1935/2004 and FDA CFR 21 compliant). Moreover especially pre-configured pump sets for typical applications are available. Electric and Air Motor drives available. FLUX eccentric worm-drive pumps are suitable for pumping thin to high-viscosity fluids. The displacement pumps work with low turbulence at a constant pressure and provide for a gentle and pulsation-free operation. 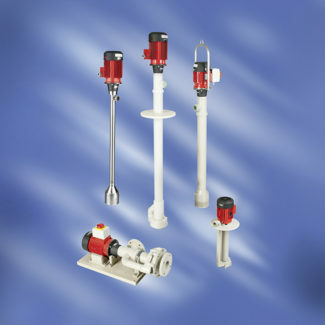 Whereas the series 550 pumps are used in the industrial sector the series 560 is especially configured for the pharmaceutical, food and cosmetics industries. For pumping especially high-viscosity media there are drum emptying systems with eccentric worm-drive pumps available. FLUX centrifugal immersion pumps are used when larger flow rates, continuous running or special immersion lengths are required. They are especially suitable for pumping and circulating aggressive and abrasive media. There is a choice of different materials available depending on the chemical and thermal requirements. In addition sealless and horizontal versions are available. 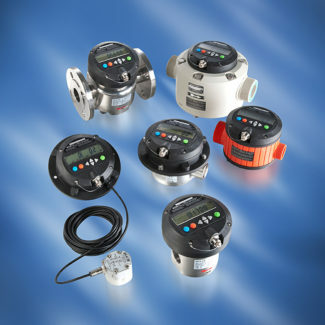 FLUX flow meters constructed on the nutating disc principle (FMC), oval rotor (FMO) or the turbine principle (FMT), provide the right solution for every application. Depending on model and overall size they can be used on e.g. FLUX drum pumps or stationary e.g. in pipe lines. Due to the flexible modular system FLUX is able to offer a wide range of options. This makes it possible to configure the mixer components of motor, shaft and mixing blade optimally for the application’s requirements. The FLUX mixers are available in various materials and with different mixing blades. 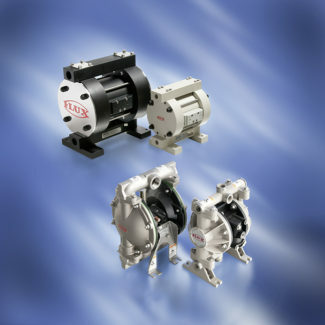 For driving the FLUX pump a wide range of electrical to pneumatic motors is available. Even if you work in hazardous areas or with flammable liquids. 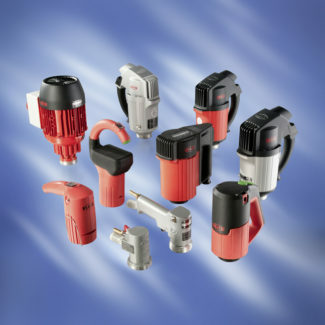 Depending on the application, different pumps can be driven by different motors. Thus, the output of a drum pump depends, among other things, on the power of the motor. Here you will find the most economical and safest drive solution for your application. These motors are featured for the series F300, F400 and the F500 pumps.